The LifeProof Bike and Bar Mount for your iPhone 5 fre and nuud Cases let you to hit the road, track or trail with your iPhone 5 along for the ride. By keeping your GPS, camera, performance trackers, training apps, music and communications front and center, you get the most out of every ride. 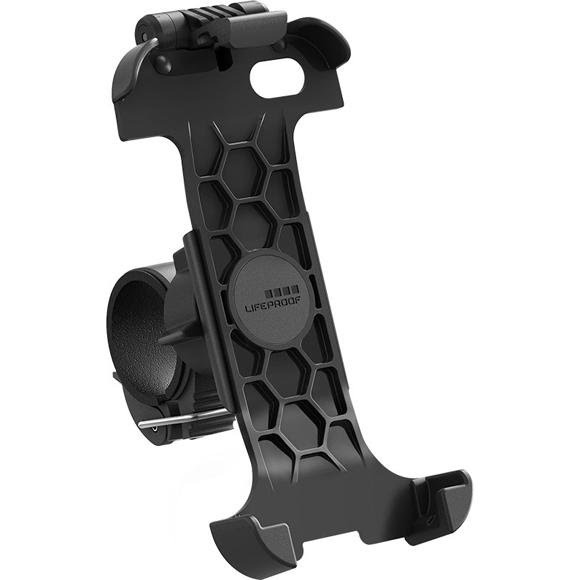 Thanks to custom-shaped locking cradle, the Bike and Bar Mount keeps your LifeProof-equipped iPhone 5 locked in place. So if you&apos;re riding road, bombing hills or pulling back flips, your phone stays secure. The quick-release clamp installs with ease and adjust to fit a wide array of bar sizes. And, it&apos;s not just for bikes. Motorcycles, jet skis, gym equipment, grocery carts, you name it. If it has handlebars, you can mount your iPhone 5 to it. Whether you&apos;re using your iPhone 5 to stay on route, monitor performance, listen to tunes or record the ride on your iPhone-turned bike cam, the LifeProof Bike and Bar Mount transforms your steed into a bicycle built for two - for you and your iPhone 5 that is! So, mount your phone, grab the grips and go! Perfect for bicycles, motorcycles, jet skis, shopping carts, etc.